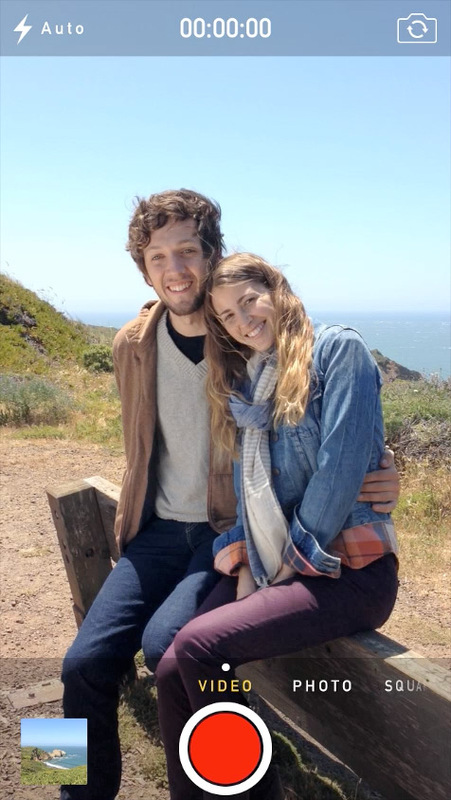 Well, it’s almost summer… the days are long, and WWDC 2013 is in the air. (Long sniff) Smell that Apple OS update in the air. This time around, OS X gets a refresh along with a slightly overdue update to the Mac Pro, and, of course, the long anticipated iOS 7 refresh. 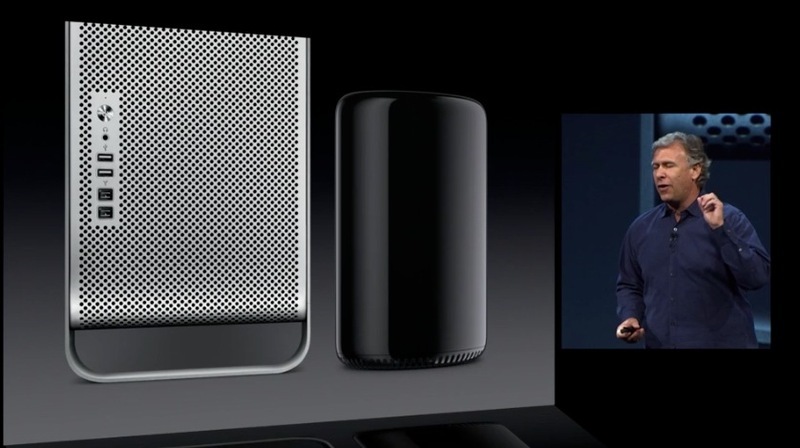 First off, the Mac Pro. One word… Wow. A truly new imagining of how to construct a desktop PC. Not since the days of the earliest PCs has there been such a radical design change. Sure, towers gave way to mini towers, and slim devices have come along too, but they’re all basically the same thing, a box. A Monolithic design ubiquitous with most electronics from PCs to stereos to VCR and DVD players to Cable boxes and alarm clocks. Just a more or less plane box. 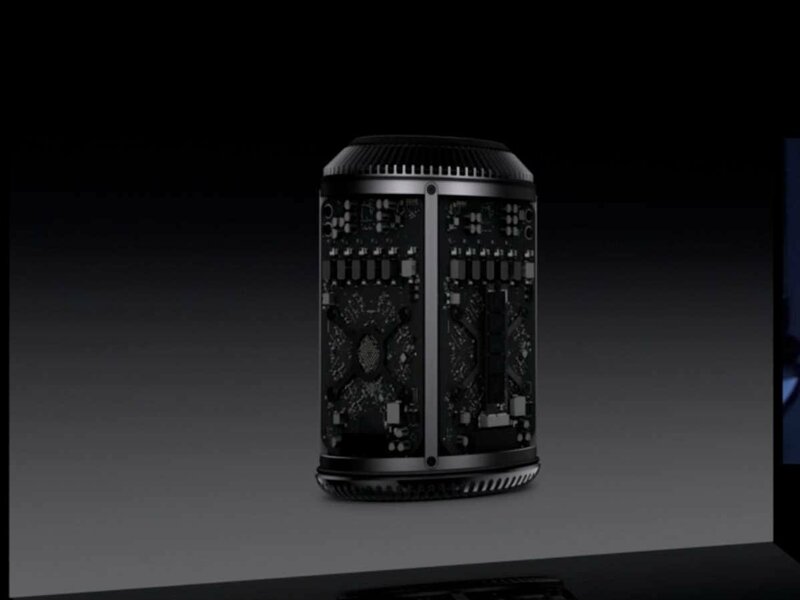 The New Mac Pro sports a cylindrical design, that mounts circuit boards around a common cooling core. The sleek exterior spins around to reveal the I/O connections on the back (which lights up by the way when you spin it). In the image to the left, you can clearly see in the size difference when stacked up against a current generation Pro, it’s about 1/2 the height (and 1/4 the depth to reach 1/8th volume). 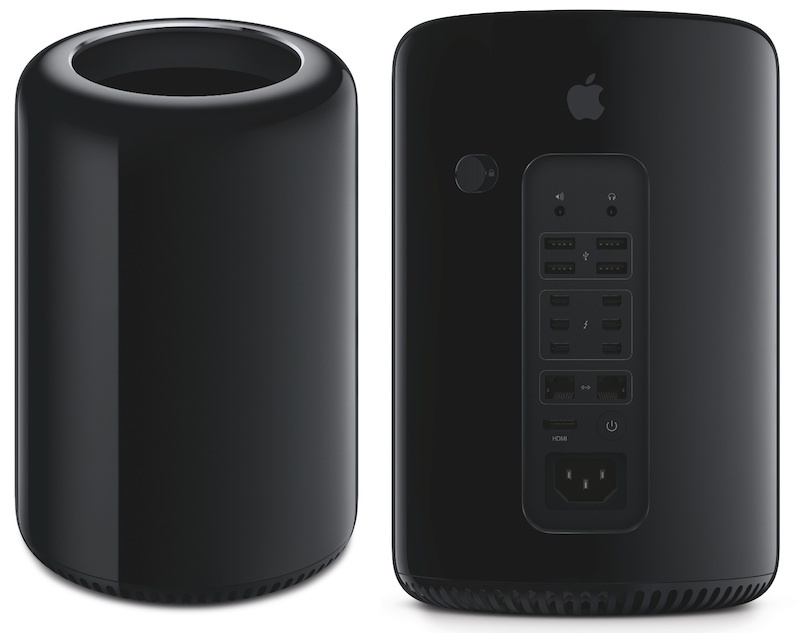 Imagine 4 or 5 Mac Minis stacked one atop the other. Seems the biggest deal is the move away from the cat naming convention, apparently they’ve ran out of big cats to name the current version of OS X. Mainly more IOS integration with notifications, iBooks, etc. The big thing was the webification of the iWork suite. Pages, Numbers, and Keynote all run in the cloud via iCloud from a Mac, iPad, iPhone, or even a Windows based PC. 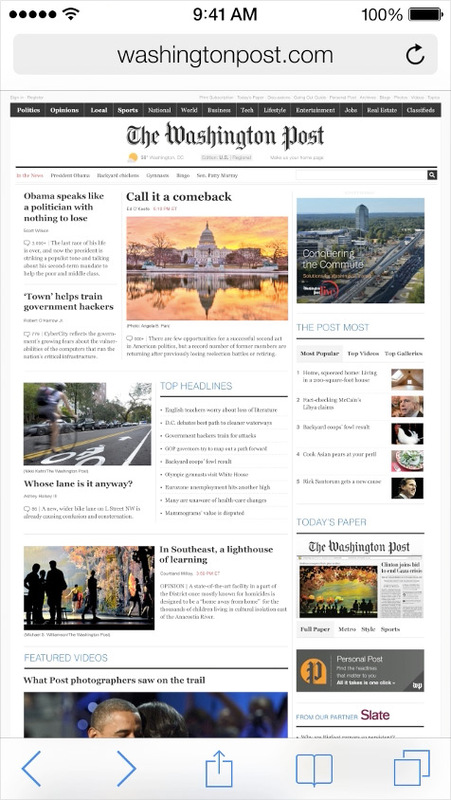 Pretty impressive app like action from a web browser. One way to get the feel of Apple from a Windows based PC. One of the biggest “complaints” about iOS has been it’s lack of “update” to the user interface. Android has undergone a number of user interface changes not to mention the multitude of manufacturer and carrier UI changes like HTC “Sense” and the like. I personally never really complained about the lack of change in the user interface because lack of change breeds an automatic familiarity with the newest version when it hits. That, plus, why mess with what works well and is already quite intuitive. However, there’s always room for improvement, and the industry has been leaning towards the clean, flat interface devoid of the likes of leather, wood, and bubble plastic icons. One of the interesting things is that the entire OS takes on a color set based on the wallpaper chosen to integrate the wallpaper into the OS in the best, albeit most subtle way. The fonts are of various sizes based on the importance of the text, much like you seen in Windows 8 “Metro” design. The notification window also sports a new “today” tab that coalesces all notifications for today in one place. 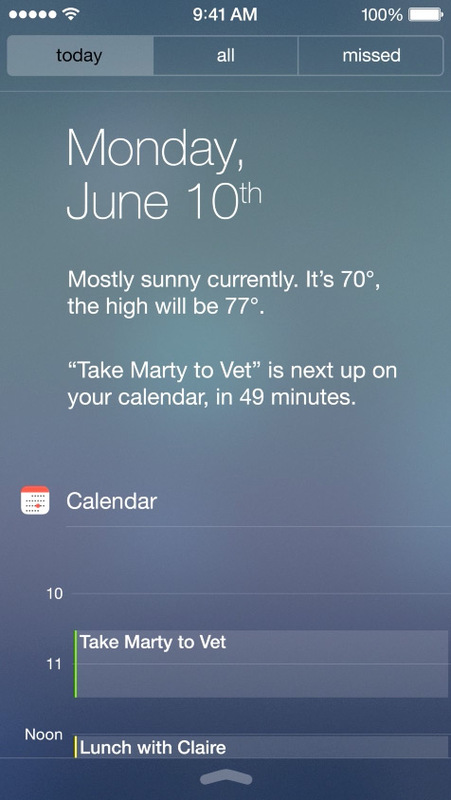 Also, the notification center can be called up from truly anywhere now that you can reach it via the lock screen, without having to unlock the screen. One interesting note is that now all apps can be multitasking thanks to some still heavier thinking on the parts of Apple engineers to deliver full multitasking across all apps, yet still deliver long battery life. The tricks come by grouping notifications, updates, and the like together based on various conditions. For example, a users wakes up the phone many times in a given day, so instead of waking the phone up to update notifications, the phone will sneak those in at times when you have the phone away, and already drawing power. That way, when the phone is asleep, it’ll stay asleep conserving battery power, and when you open the phone to check your email, the phone will sneak in those instagram and facebook updates while the phone is awake rather than forcing the phone awake when it’s asleep. That translates into far less wake/sleep cycles which translates into longer battery life. This is one of the biggest reasons I like iPhone over any other… Apple’s unending push to find ways to extend battery life even longer. The addition of an Internet radio station has been speculated for quite some time. Today, it showed up with what was pretty much expected. 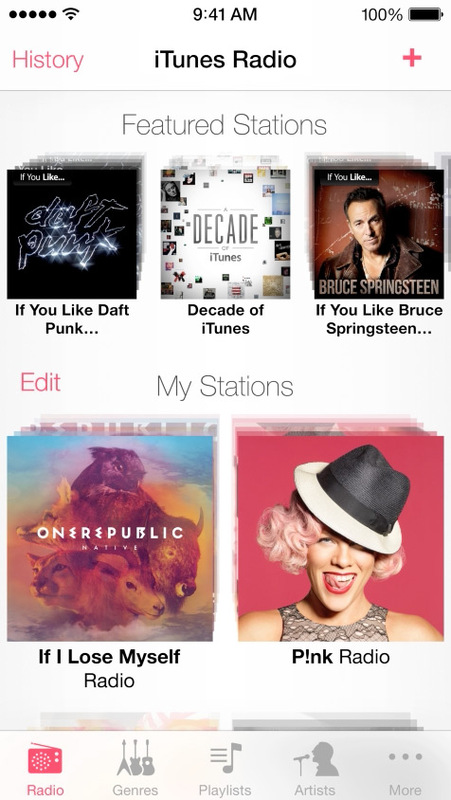 A Pandora like internet radio with integrated iTunes purchasing of a song you’re listening to a click or two away. Part of the magic to the new interface is the logical layers that have been created. Essentially, menus and notifications are on the top layer, content (apps, home screen, etc) are in the middle, and the background is the farthest layer. On the home screen, the accelerometer is used to control the drift of the wallpaper while the icons stay fixed on layer 2. The result is a parallax effect that causes the icons to just pop on the display. Control Center is Probably the most anticipated feature to finally make it to iOS. I remember back as far as the iPhone 3G fake videos showing something along the lines of control center where one can quickly and easily access the most commonly used settings such as wifi, bluetooth and airplane mode. Aside from that, you’ve got do not disturb and orientation lock, a flashlight, brightness, audio controls and access to the new Air Drop as well as Air Port features. 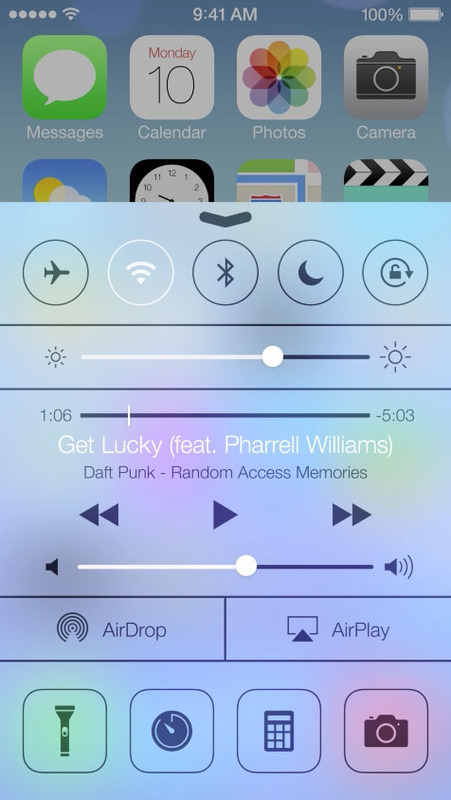 Control center is accessed by swiping up from the bottom, and being a menu, is translucent like all menus are now. Siri has now been updated to allow you to reach some settings as well. You can say “Turn on bluetooth”, or “Read my last voicemail”, so besides control center, you can use Siri as well. Also, a number of car manufacturers are integrating the iPhone into their vehicles via the built in touch screen in the car. Using Siri, there’s a number of “eyes free” functions that can be done while driving without taking your hands off the wheel such as having a message read to you, making a phone call, or just about anything else including map functions so you can have the GPS integrated right into the vehicle’s display. Air Drop is a cool feature. It enables sharing locally. Any app that supports share sheets allows you to bring up a page. That page will automatically have anyone within range in the list displayed. You can then simply share by selecting those people from the list and the content you’re sharing is sent to those phones. 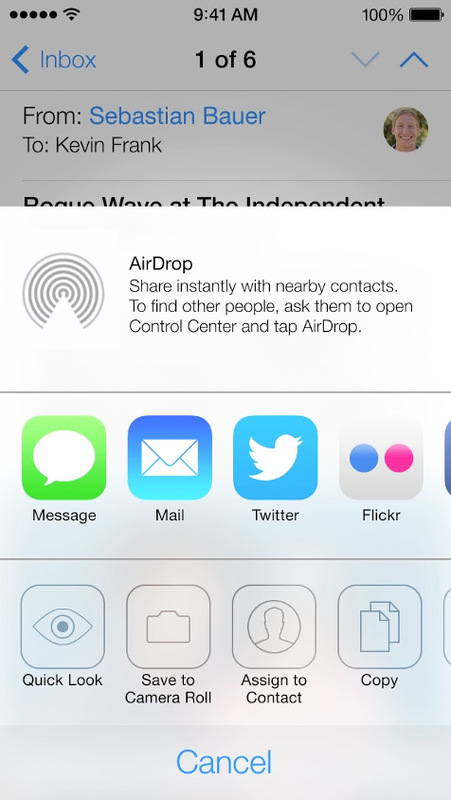 The recipients get a pop up informing them and they can accept or decline the share. “No need to run around the room bumping phones”… a clear jab at the bump sharing feature found in the latest versions of Android. A feature most Android phones don’t even have because the most popular version of Android out there right now is still Android 2.3, which was released in 2010. One of the things I’ve always liked better about Android over iOS has been the animated weather screens. 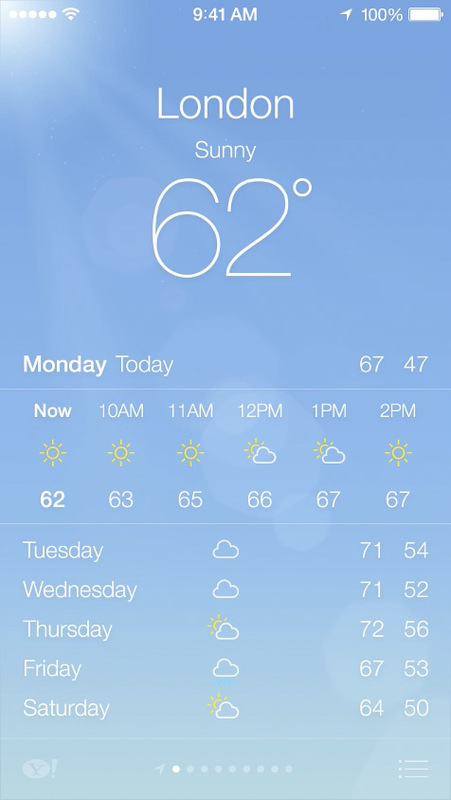 Finally, iOS gets some great animations for snow, rain, thunderstorms, sunny day, etc. Another cool feature of the weather app is that you can pinch out and get an overview of each city in the app along with current time at that location giving you quick access to time and temperature for a possible destination. This long overdue update to the weather application is something I’ve been waiting on forever, and I’m really happy with how it turned out. I knew once Apple tackled updating the app, they’d come up with something really cool, and they didn’t disappoint. The Camera application has undergone quite a change in terms of operation, but it’s quite intuitive. You can easily swipe from video recorder to camera to cropped camera (square image), to panorama. All the same functionality as before, just a much simpler way to switch between the cameras. The biggest change to the camera is not the camera application itself, but the camera roll. Making folders so that you can sort your photos is doable, but it has to be done on your computer, then synced to the phone. Not only that, most people don’t even know you can do that, so the vast majority of people have one big camera roll with years worth of images stored in one continuous thumbnail page with hundreds, if not thousands of images. Photos and videos have long since had EXIF meta data which includes GPS and time/date information embedded into the photo or video. Using this built in structure, the phone will automatically sort based on location, then by time. For example, if you visited 8 places over the course of 3 days, when you bring up the camera roll, you’ll see 8 sections, intelligently named again automatically sorting those places you visit, you can then pinch out, and those 8 sections become 3 sections separated by day, and you can drill out even further to view sectioned off by year. You can then tap and hold, slide your finger around to get a thumbnail pop up so you can browse your photos to find just the one your looking for. 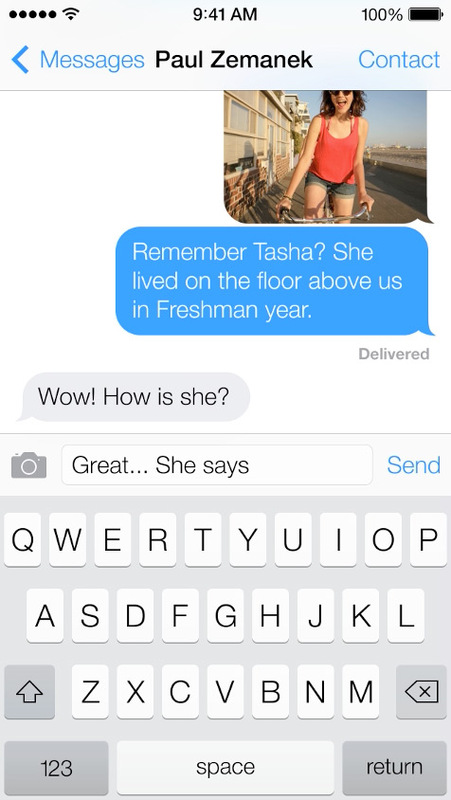 This is a huge jump in how the images are presented, and is automatic, logical, and will be a hit for sure. 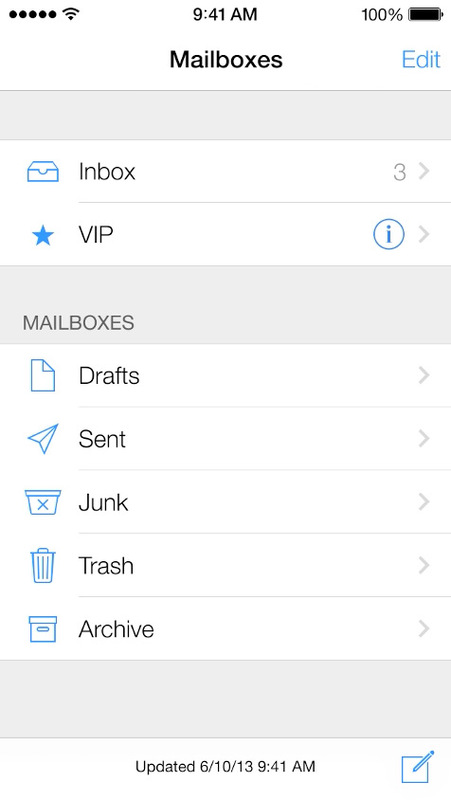 Mail, Messages, and Safari have also undergone some updating besides the user interface look and feel. Safari for example is no longer limited to 8 tabs, and tabs are now presented in a sort of rolodex file format and you can drag to sort or swipe left to dismiss a page. The page displays full edge to edge, and the upper and lower bits dismiss themselves giving you the most display possible to view the page. Also, just like OS X, you can simply scroll from article to article on your reading list without having to go back to select the next story, they are simply presented one after another. Mail and Messages both have changed a bit too. you can now swipe from left to right with your thumb (for one handed operation) to go from your inbox or conversation list to an email or conversation, so navigation in both applications is alot smoother.